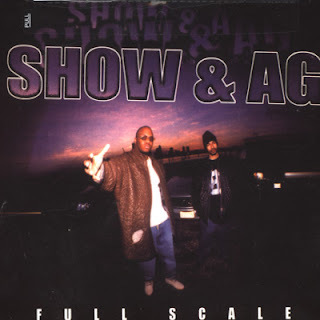 Full Scale is a 1998 release from Hip Hop duo Show & A.G. The EP features appearances from O.C., KRS-One, Big Pun, the Ghetto Dwellas as well as most members of their crew D.I.T.C. including Diamond D, Big L and Lord Finesse. Two versions were released in early '98; Full Scale EP featured 5 songs plus instrumentals and was only available on 12" vinyl. The CD version, Full Scale LP included the same 5 songs found on the EP but with an additional 10 tracks, thus making up a full length album. Four of the songs from the CD later appeared on the self-titled D.I.T.C. album released on Tommy Boy in 2000. The songs were "Dignified Soldiers", "Drop It Heavy", "Spit (Remix)" and "Time To Get This Money", 2 of them being remixed for the album while the other 2 appeared in there original form. Production on Full Scale is handled by Showbiz & A.G. except for "Time To Get This Money", produced by long-time collaborator Ahmed, and "Hold Mines" plus "Hidden Crates" which were produced by DJ Greyboy. 04. Full Scale feat. O.C. 06. Time To Get This Money feat. Diamond D & O.C. 08. Dignified Soldiers feat. Big L, Lord Finesse & O.C. 11. Dignified Soldiers (Remix) feat. Big L, Lord Finesse & O.C.